Prime Minister Sheikh Hasina on Wednesday asked Bangladesh Navy to use their efficiency and integrity in tapping sea resources in view of the country's now expanded maritime boundary. "Bangladesh now possesses a vast sea area blessed with plenty of natural resources through peacefully negotiation with neighbours. So Bangladesh Navy has to play its due role to exploit the resources and protect the sovereignty of the maritime areas," she said. The premier said navy would now need to work to implement various programmes of "blue economy" and expected its personnel to discharge their duties more effectively and successfully, being inspired with the liberation war spirit. Sheikh Hasina made the call as she was addressing a function at BNS Issa Khan Parade Ground where she awarded the National Standard to BN Dockyard after inaugurating Bangabandhu Complex at Bangladesh Naval Academy at this southeastern port city. The Premier said BN Dockyard earned the National Standard for its unique services for the development and modernization of Bangladesh Navy and called the ceremony a "glorious chapter" in the force's history as she handed over the National Flag to the dockyard's commanding officer Commander Imtiyaz Uddin. She acknowledged the BN Dockyard as the main driving force of navy's operational activities and its crucial role for protection of the sovereignty of the country's large maritime areas. "The dockyard is performing its duties with utmost patriotism and professional competence for proper maintenance and modernization of the three-dimensional and hi-tech warships and submarines," the premier said. Sheikh Hasina noted that the dockyard's floating dock BNFD Sundarban and its Slipway by now carried out the docking and maintenance services of more than 1,000 local and foreign ships. She said with its own manpower, technology and technical capacity, the dockyard kept operational the warships for longer period through their proper maintenance, saving a large amount of foreign currency also earning the international compliance standard ISO9000. On her arrival at BN Dockyard, navy chief Admiral Mohammad Nizamuddin Ahmed and the dockyard's Commodore Superintendent Commodore Moyeenul Haque received her at the scene where she was given state salute amid the playing of the national anthem. Different navy units staged an attractive parade to mark the event while the premier inspected the parade and took the salute. Sheikh Hasina said newly built Bangabandhu Complex at Bangladesh Naval Academy which is equipped with modern facilities would ensure global standard training for the members of the navy. "A dream of Father of the Nation to build an international standard training academy for navy has been materialized through the inauguration of the complex", she said. The prime minister said Father of the Nation had procured a number of modern warships soon after independence to build a strong navy while in 1974 he had commissioned the largest training naval base BNS Issa Khan and awarded the naval ensign to Bangladesh Navy. 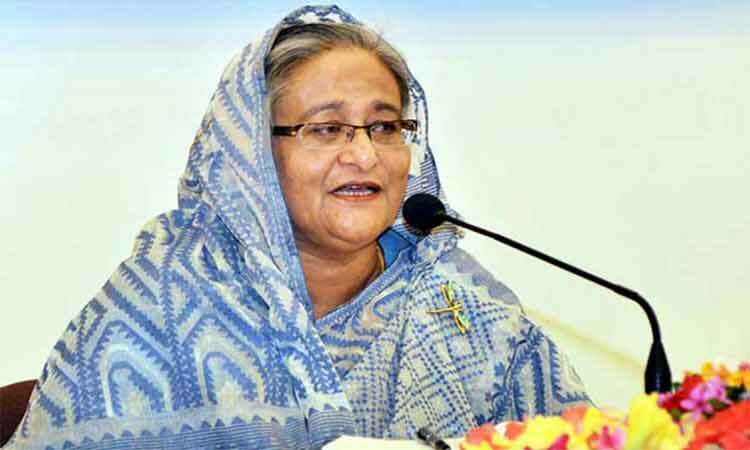 In the same year, she said, Bangabandhu government enacted the 'Territorial Waters and Maritime Zones Act' to ascertain Bangladesh's maritime boundary while her government was following the Father of the Nation's footprint for continued progress and modernization of the force. The premier said navy had witnessed massive development and welfare programmes during her government's 1996-2001 tenure while in the last nine years the force enhanced its capacity with its modernization. "Bangladesh navy is now a three-dimensional force after induction of submarines to its fleet," she said. The navy, she said, now has the highest number of warships and rich naval aviation with patrol aircrafts and helicopters along with specialized force SWADS while the process was underway to procure more modern aircraft and helicopter to strengthen vigilance and patrol in the sea. The prime minister said works were also underway to build the Bangladesh Navy's biggest naval base in Patuakhali with aviation facilities, Bangabandhu Sheikh Mujib Naval Base in Dhaka and a submarine base in Kutubdia. Sheikh Hasina said construction of fleet headquarters along with berthing facilities of ships has begun at Sandwip Channel of Sitakunda, Chittagong, adding that it will more strengthen the security of the maritime areas. The premier said sea route is the mode of more than 90 percent trade of Bangladesh. The navy is successfully discharging its duties to ensure security and safety of the large maritime areas of Bangladesh. Bangladesh Navy is playing a praiseworthy role in ensuring security of the commercial vessels and checking human trafficking, smuggling, security of the fishermen and economic development of the country, she said. She thanked Bangladesh Navy for constructing temporary shelters at Bhasanchar for forcibly displaced citizens of Myanmar. Sheikh Hasina said Bangladesh Navy is a well-known force in the world. Ships of the navy are taking part in many military exercises abroad and conducting many training exercises on their own in the country. "Only the warships of Bangladesh in the subcontinent are successfully deployed in the Mediterranean Sea under Multinational Maritime Taskforce, brightening the country's image across the world," she said. 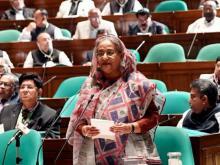 Sheikh Hasina said Bangladesh is moving ahead due to the constant stride of her government. In last nine years, she said, her government has implemented massive development programmes in every sector. Ninety percent of the works are being implemented with own resources, she added. The prime minister said poverty rate reduced to 22 percent while per capita income rose to US$ 1,160 with growth of the GDP is now 7.28 percent, adding that Digital Bangladesh is now a reality and the country has entered the era of 4G from 3G. She said Digital Centers were established in every union. Ninety percent people have access to electricity. People are getting health services at their doorsteps while their life expectancy is now stands 72 years. Pointing out the ongoing development of the present government, the premier said Padma Bridge is being constructed with own resources.Construction works of metro rail, Paira Port, tunnel under Karnaphuli and LNG terminal are going on in full swing and Bangabandhu Satellite would be lunched very soon, she added. Sheikh Hasina said Bangladesh has acquired the status of a low middle income country and formally started its journey to enter the group of the developing countries from LDCs. "The acknowledgement is an epoch making milestone for Bangladesh's development and one step forward on the way to build 'Sonar Bangla' as dreamt by Bangabandhu," she said. 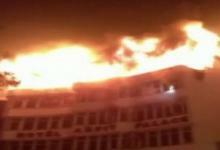 The premier said Bangladesh must go ahead and will remain in the world keeping its head high. Bangladesh must continue its development and everybody should work together in this regard. Bangladesh would be a middle income country by 2021 when the nation would celebrate the golden jubilee of independence and much ahead of 2041, it would also be a developed nation, she hoped.